Our model miles will help make the Firefly Trail a reality in Maxeys, Union Point and Athens, providing safe options for exercise and transportation while demonstrating the benefits the full trail will provide. Thanks to the generosity of more than 300 donors, Firefly Trail Inc., exceeded its Model Miles Project fundraising goal, receiving nearly $62,300 in donations to augment trail segments to be built in Maxeys, Union Point and Athens-Clarke County. The funds will be used to help the three cities extend, enhance and promote their soon-to-be-built sections of the trail. When completed, the Firefly Trail will extend about 39 miles from downtown Athens to downtown Union Point, following the historic route of the Georgia Railroad Athens Branch through a number of charming Georgia towns, including Winterville, Crawford and Woodville in addition to Union Point, Maxeys and Athens. The Firefly Trail will be a 39-mile multi-purpose trail in Northeast Georgia, following the abandoned corridor of the Georgia Railroad Athens Branch. From the university city of Athens to the friendly towns of Maxeys and Union Point, the trail will promote safety, better health, economic development, transportation options, tourism, historic preservation -- and fun. Linking urban, suburban and rural landscapes, the trail will be a linear park that enhances the environment and highlights our region's rich history and culture. Firefly Trail, Inc., is a 501(c)(3) Georgia charity incorporated to spearhead the creation of the trail. We are working closely with three municipalities -- Maxeys, Union Point and Athens -- to create model miles in each city. All three cities are committed to raising substantial funding to make paving the first segments of the trail a reality. However, additional funds are needed for these projects, especially in the small towns of Maxeys and Union Point. In partnership with our communities, the Firefly Trail Model Miles Project will spur the creation of the full trail by demonstrating its transformational potential to the entire region. Your help is needed and deeply appreciated! 1. $25,000 to the town of Maxeys for purchasing paving materials, with the goal of building 1.5 miles of paved trail with unpaved side track inside the city limits. Maxeys has secured $316,000 in city funds, grants, and in-kind donations to fund this project. Paving the Maxeys Model Mile is expected to begin in June of 2017 and be completed by fall 2017. 2. $30,000 to the city of Union Point to augment funding for paving materials and construction costs, with a goal of creating a safe route from downtown to Union Point STEAM Academy, a K-8 public school which presently can be accessed only via a high-speed highway. Union Point has secured $150,000 in local funds and grants. Construction is expected to begin on the Union Point Model Mile in summer 2018. 3. Up to $5,000 to assist the Unified Government of Athens-Clarke County in promoting their first mile of the Firefly Trail, currently under construction and scheduled for completion in fall 2017. This segment is entirely funded by local sales tax revenues and federal grants. Our funds will assist the unified government in raising awareness of the new trail segment and building public support to complete the remaining 7 miles of trail in Athens-Clarke County. 4. In the event this campaign raises more than $60,000, any funds in excess of the goal will be used to provide additional assistance to Maxeys and Union Point for trail-related purposes. Safety: Many of the towns and all of the rural areas the trail will serve have few, if any, sidewalks, bike facilities or other infrastructure for off-road exercise and active transportation. For example, to walk to their elementary school just north of Union Point, students must use the unimproved shoulder of a busy 2-lane highway. In Athens, three people have tragically lost their lives since 2014 while bicycling on roads close to the route of the Firefly Trail. Health: Thousands of people living near the trail corridor are unable to play and exercise safety in their own communities. As a result, most don't. Rates of obesity, high blood pressure and diabetes are among the highest in the nation. Studies show every $1 spent on trails yields $2.94 in direct health benefits. Using the trail will not only be safer, it will be fun -- inspiring more people to get up and get moving. The Firefly Trail will bring opportunities and hope for longer, healthier, happier lives. Economic development: Many of the neighborhoods and communities served by the Firefly Trail are struggling economically. Trails create opportunities for new and existing businesses; attract new residents, entrepreneurs and tourists; boost property values, and improve quality of life. A Firefly Trail economic impact study estimates the finished trail will attract more than 1.1 million users a year and generate $14.7 million in annual economic impact. Just building the trail will generate/sustain 158 jobs. Attractive corridor: The corridor connects charming towns, beautiful countryside, schools, businesses, historic features and town centers. Importantly, as an abandoned railroad corridor, it provides a level route through the hills and valleys of Northeast Georgia, allowing people of all ages and abilities to enjoy using it. * This donation processing fee was calculated on $61,195 (a partial fee exemption made). 1. Our ribbon cutting, for our first Model Mile, was on October 20, 2017 (see video below). 2. On Tuesday, November 7, voters in Athens voted to fund approximately 9 miles of the Firefly Trail through a special transportation tax (TSPLOST). We believe that ioby crowdfunding campaign really helped elevate awareness for the need to have the Firefly Trail - thus influencing that it be part of the TSPLOST initiative. Firefly Trail exceeds Model Miles project fundraising goal; announces 'thank you' celebration. To celebrate, Firefly Trail Inc., will hold a "thank-you" party for donors, friends and the general public on Thursday, June 15, from 5:30 to 7:30 p.m. at Terrapin Beer Co., 265 Newton Bridge Road, Athens. Everyone is welcome. By using the abandoned railroad corridor wherever possible, the trail will provide an off-road path through Northeast Georgia's hills and valleys. Wide and level, it will be suitable for walkers, runners and cyclists of all ages and abilities. Trails provide a safe place where people can exercise for better health and engage in active transportation separated from busy roads. 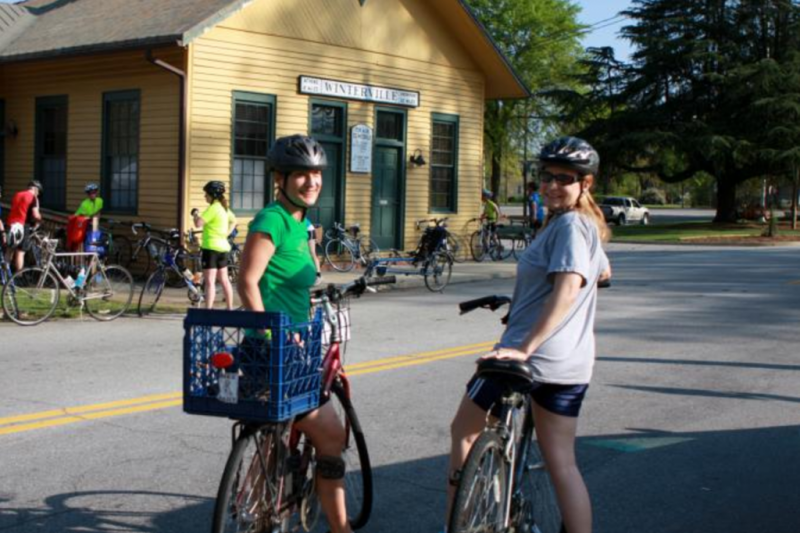 Rail-trails in hundreds of other communities across the U.S. have also become engines for economic development, attracting tourism and creating opportunities for business growth, historic preservation and environmental protection. We met our goal and there's still time to give. We're so thrilled to have met our goal a few days before our deadline! Thank you to everyone that already made their donations - we couldn't have done this without you. Feeling left out? There's still time to give, our deadline is June 3rd, and we'll put every dollar raised to good use for our Model Miles project. Thank you again! We're so excited about the overwhelming support and response from our communities. Thank you to all 106 residents, businesses and community groups that made donations during our $15,000 matching grant challenge, sponsored by The Riverview Foundation. Your generous and timely donations, ranging from $1 to $2,000, directly resulted in an extra $15,000 for our Firefly Trail Model Miles in Athens, Maxeys and Union Point! This is a big win & we think you're awesome! 1. Call or talk to 5-10 of your closest friends, family & co-workers about this project. Ask them to give a few bucks by June 3rd. Every donation counts! 3. Tag us & tell us why you made a donation and why this trail is important to you! Deadline extended to June 3rd! The Firefly Trail Model Miles Crowdfunding Campaign Deadline extended to June 3, 2017!! The Firefly Trail Board obtained an extension because there is approximately $4000 in funds still available from the Riverview Foundation that donors can match. We hope that this extension will allow potential donors the time they need to make their contribution. Whether it's $5 or $500, we need your support before June 3rd. If you haven't made your gift yet to this trail project, please consider joining the more than 200 individuals, families and businesses who have already made a donation. We can't do this without you and every gift counts! Thank you to our Ticket To Ride Donors! Thank you for all of the support we received during the Ticket To Ride event! 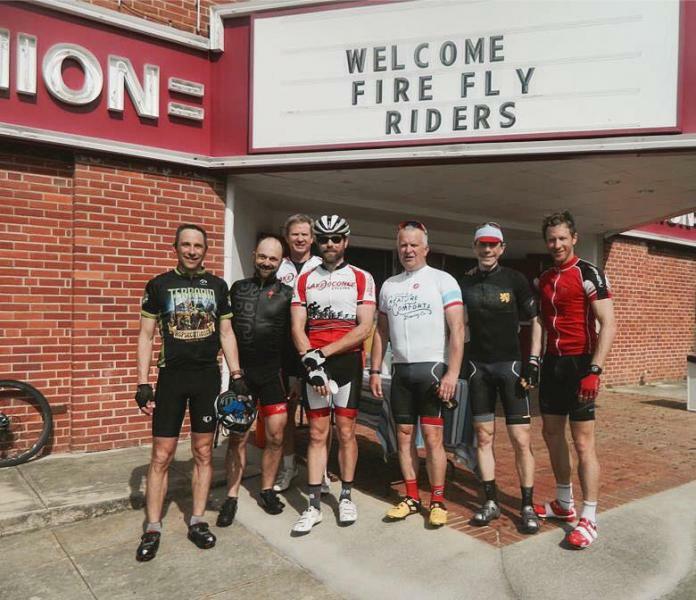 We had record numbers at our 6th Annual Firefly Trail Ticket to Ride roll out of Athens and Winterville on Saturday, March 25. Thank you to all those who came out in support of the Firefly Trail. Your generous donations helped us raise an additional $1,000 (plus the match) for our Trail! Check out more great Firefly Trail Photos here. Double Your Donations - Special Match Announced! GreenScapes Shrub & Turf, Inc.
$25-$99: Leveling the Dirt. (This level offers name recognition on our website, newsletter and an annual Firefly Trail membership). $100-$499: Surveying the Trail. (This level offers name recognition on our website, newsletter and an annual Firefly Trail membership). $500-$999: Transporting the Asphalt. (This level offers name recognition on our website, newsletter and an annual Firefly Trail membership). $1000-$4999: Landscaping the Trail. (This level offers the same as above plus name recognition of the donor on the trail). $5000 - $10,000: Paving the Trail. (This level offers same as above plus featured name recognition of the donor on the trail).